Living… in an alternate, technologically advanced 1939. In this reality, humanity fully embraced the skies, and makes frequent and full use of zeppelins and personal planes. 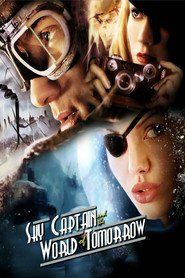 The Sky Captain himself spends most of his time in his secret hideaway in New York. Profession… free-lance pilot. Joe Sullivan is one of the best pilots around, earning him the nickname, “Sky Captain.” He’s so good that he no longer flies for any national air force. Instead he manages his own private, airborne army, the Flying Legion. The Legion waits in its secret base in New York, leaving only when the world is in danger. Relationship Status… complicated. Three years ago, Joe used to date Polly Perkins, a young investigative reporter. They broke up when Polly sabotaged his plane back when he was stationed in China. He’s also had a relationship with Commander Franky Cook, who leads a Royal Navy flying aircraft carrier. When Joe runs into Polly again during an attack on the city, he finds himself awkwardly caught between his two old flames – a situation that makes the robot attack feel like a fun diversion. Challenge… getting to the bottom of the recent giant robot attack on Manhattan. Apparently, attacks are happening all around the world, and they seem to be connected to the disappearances of several top scientists. Polly seems to have a lead on the case, and Joe is forced to begrudgingly agree to let her tag along. Personality… brave, flirtatious, and fearless. Joe thrives in dangerous situations and is more comfortable flying a plane through the legs of giant robot than most people are parallel parking. He lives his life in the skies and feels happiest when he’s there. Though he’s currently single, Joe has often used his charismatic charms to win the affection of many women. This charm tends to be short-lived, however, and he’s never been able to sustain a romance for very long. He’s particularly inept when it comes to managing the fallout of a relationship that crashed and burned, and the prospect of dealing with both his exes at the same time is one of the few thoughts that cause the intrepid Sky Captain to feel fear. Sky Captain's popularity ranking on CharacTour is #2864 out of 5,000+ characters. See our top-ranked characters and read their profiles.